The best jewelry is always made from the best stones. But having the best stone doesn’t really do any good without the proper stone setting. There are many ways to set your gemstones, but one of the best ways is often a prong setting. Prongs hold your stones securely without obscuring them. ABOVE: Noël Yovovich, Prongs Illustrated. Iolite, sugilite, garnet, sterling silver, 18K gold. Photo: Jim Lawson. The January/February 2019 issue of Lapidary Journal Jewelry Artist is the annual gemstone issue. In it, a project by jewelry artist Noël Yovovich shows you different ways to use prongs to show off your stones to their best advantage. Her “Prongs Illustrated” pendant teaches two prong stone-setting techniques to set to complementary stones. In this excerpt from the project, Noël explains how a prong setting can often be the way to go in your jewelry designs, whether you go with premade prong settings or make your own. She also gives you excellent tips for using gold to create your stone settings. At its most basic, a stone setting has some metal that extends up the stone far enough to hold it down, and does that in enough locations to keep the stone from slipping out. Sound simple? It can be — but happily it doesn’t have to! If you want to set a stone on a piece of jewelry, you have a lot of choices in how to do it. Bezels, settings that completely surround the perimeter of the stone, are beautiful and secure. For me, they are generally the preferred method. In the interest of full disclosure, I’m not a big fan of Tiffany or other standard prong settings — at least not on their own. It is also one of my oft-stated principles to avoid doing anything by hand that is done better by a machine. There are many times when a purchased prong setting is a great choice. Manufactured prong settings come in a wide array of styles, sizes, and materials, and many come prenotched and ready for you to pop in your stone. If you want a great guide to setting stones in existing stone settings, I highly recommend Alan Revere’s comprehensive book, Professional Stonesetting. There are, however, many situations where commercial settings are not going to help you. This project presents two. 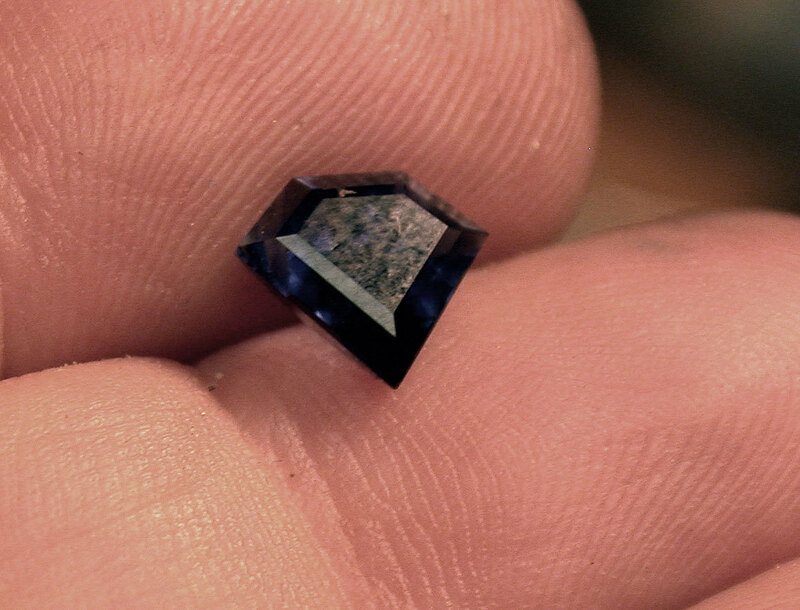 Shield-shaped faceted iolite. Photo: Noël Yovovich. 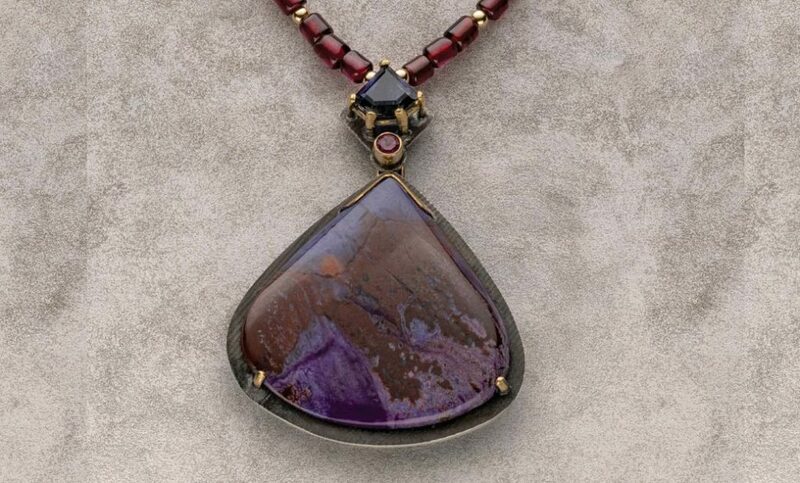 One of the stones I chose for this necklace is a shield-shaped faceted iolite. 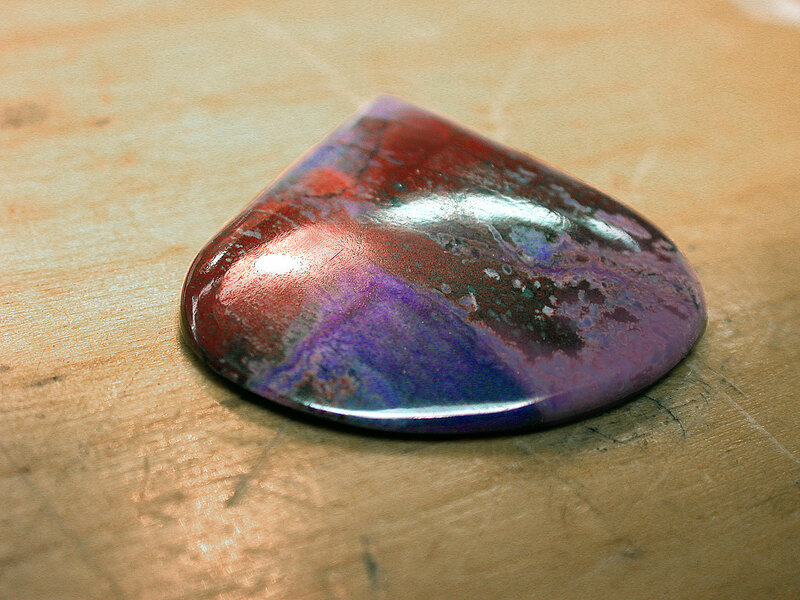 It’s a really beautiful stone I wanted to show off, but this shape isn’t available in commercial settings. So [I constructed] a gold prong setting for this gem in the simplest way I could come up with. The other main stone in this pendant, a gorgeous piece of African sugilite, has its own challenges that seem best solved with a partial bezel and two simple prongs. Teardrop-shaped African sugilite. Photo: Noël Yovovich. If you are going to set a beautiful and special stone in prongs, even if you buy a setting, you really should set it in gold. Silver is not really stiff enough to make a secure setting unless you make the prongs quite bulky, and that will largely defeat the purpose of using prongs. White gold is good and stiff, and 14K yellow is a close second. But even 18K yellow, which I prefer and use here, is much stronger than silver. If you measure carefully enough, your stone should fit nicely on this setting once you bend the prongs out slightly, with the prongs lining up with the points of the stone. Photo: Noël Yovovich. Carefully solder your prongs to your bezel. 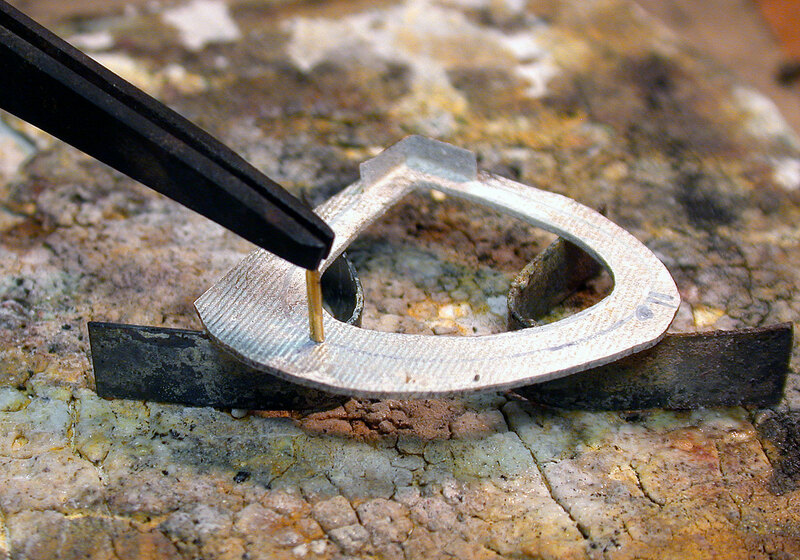 The partial bezel and the prongs should be attached before the outside of the backing is trimmed. Photo: Noël Yovovich. Complete step-by-step instructions for creating Noël’s stunning pendant can be found in the January/February issue. You can use iolite and sugilite as she did — or choose your own stones. You can also take the prong stone-setting techniques from the project and run with them, creating your own jewelry masterpiece. But maybe prongs aren’t really your thing. If you prefer to use bezels to set your stones, check out Michael Cheatham’s demo, “State Your Findings.” In it, he demonstrates how to make your own big bold bezels and bails to complement your stones and complete your jewelry design. And if you want to try a really different and unique stone setting, try Mary Van der Aa’s “In Orbit” pendant. 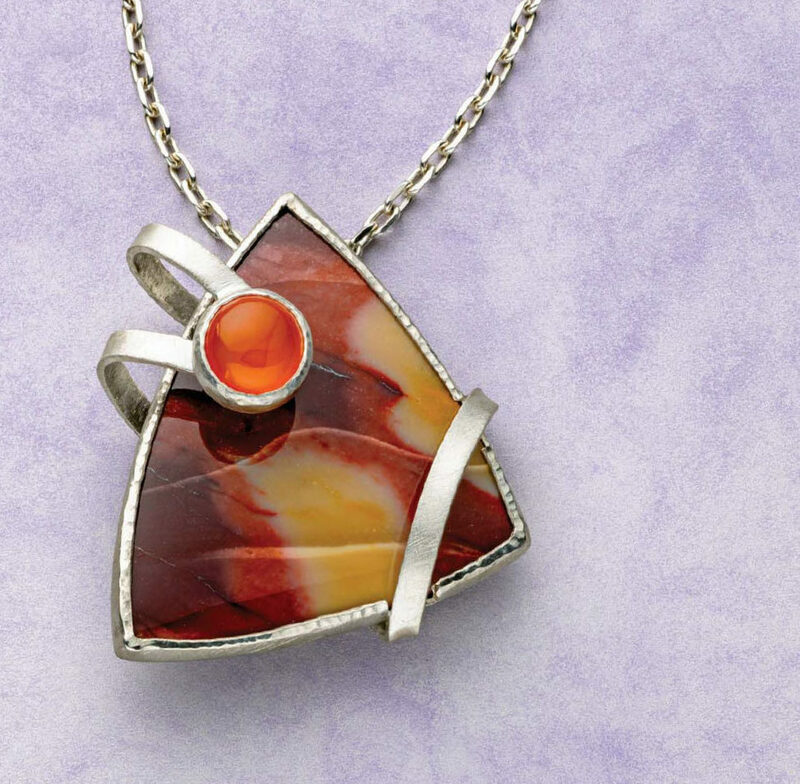 This gorgeous design uses a “wraparound” bezel setting to display mookaite jasper. It’s a fabulous way to set an unusually shaped stone. “In Orbit” by Mary Van der Aa. Mookaite jasper, citrine, silver. Photo: Jim Lawson. The January/February issue also contains a delightful variety of other projects to teach you more jewelry-making techniques and to serve as inspiration for your own jewelry creations. “Two Tones & a Twist” by Kylie Jones. Iolite, sterling silver wire. Photo: Jim Lawson. 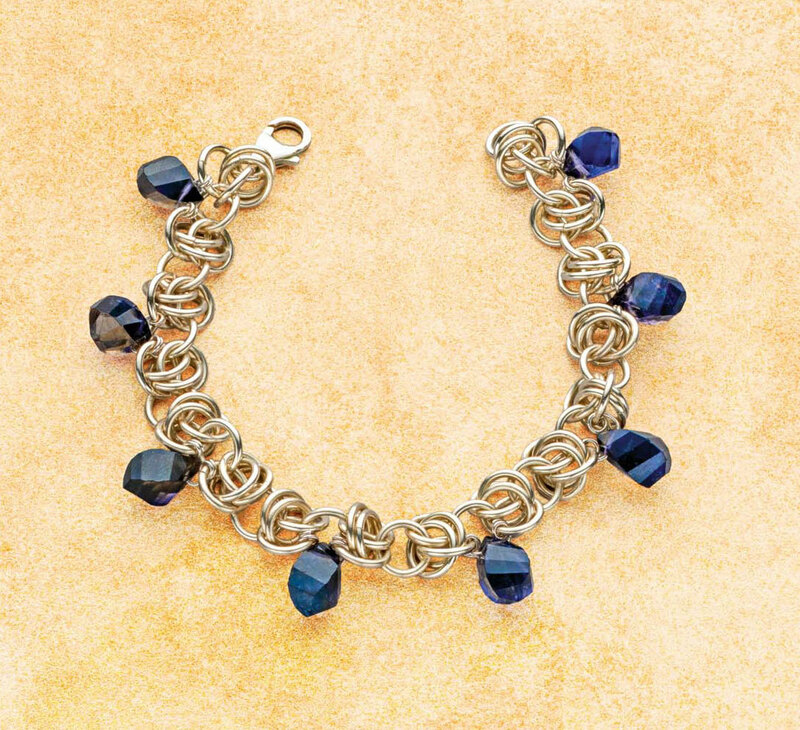 You can use chain maille and iolite briolettes to make Kylie Jones’s “Two Tones and a Twist” bracelet. Or if you want to attempt cutting your own stones, check out Jim Perkins’s “With an Open Heart” facet design for synthetic ruby. “Steel & Gold: A Love Story” by Bette Barnett. Steel, gold, pearl. Photo: Jim Lawson. 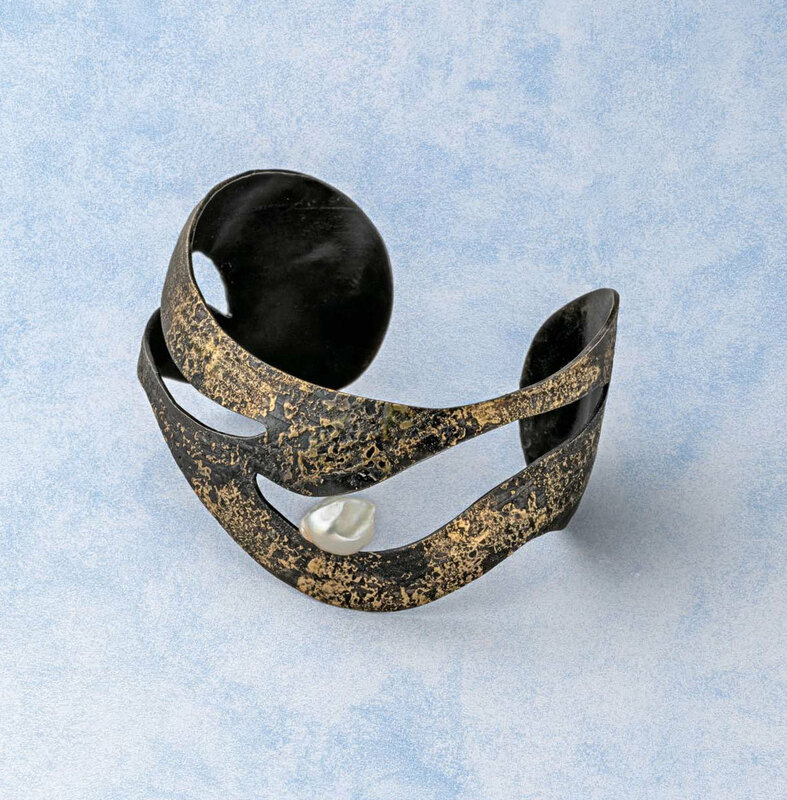 For something really different, try Bette Barnett’s “Steel & Gold: A Love Story” cuff. This fantastic project teaches you to combine two disparate metals into one amazing piece. “Starlight in Her Hair” by Noël Yovovich. 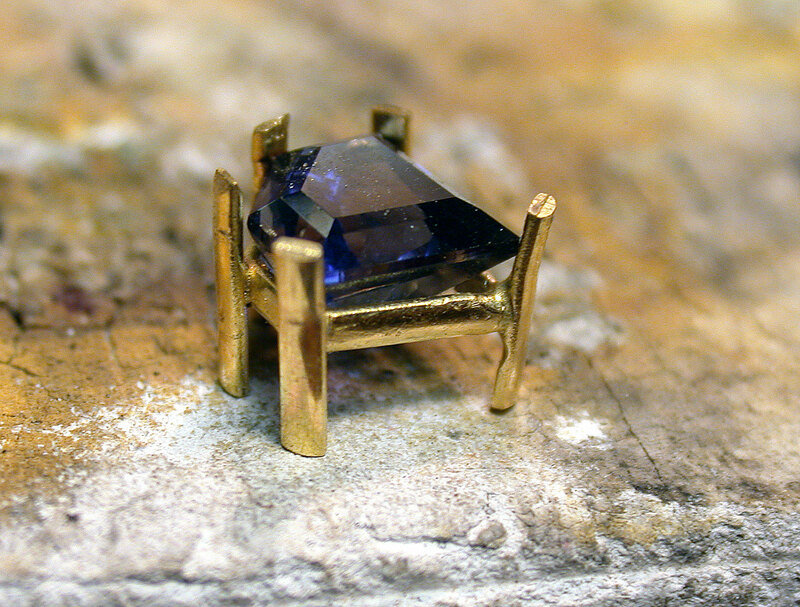 Lab-grown sapphires, wire. Photo: Jim Lawson. And if you can’t get enough of Noël Yovovich’s designs (I know I can’t), you’ll also find her “Starlight in Her Hair” project in the issue. 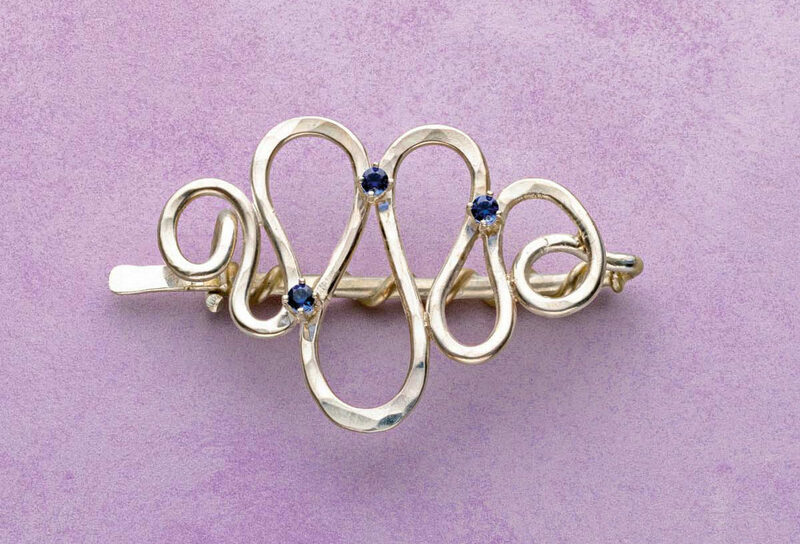 This piece combines silver wire and blue sapphire into a stunning barrette. And to continue the stone setting theme, it uses premade purchased prong settings. All of these projects can be found in the January/February issue of Lapidary Journal Jewelry Artist. 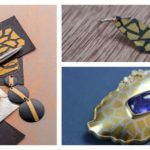 But you can also order them individually — along with hundreds of other fantastic jewelry-making projects—in the Interweave Store..
Get ready, get set . . . set! Can’t get enough stone setting? Get all the instruction you could want at a special value when you build your own stone-setting bundle. Master all kinds of gemstone settings with these expert resources!